A cyberattack is personal — even for organizations. At its very core, it strips businesses, enterprises, governments and employees of their intellectual property, identities, privacy, reputation and monetary assets. 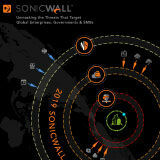 SonicWall remains steadfast in its commitment to research, analyze and share threat intelligence with the 2019 SonicWall Cyber Threat Report. eSentire Managed Detection and Response (MDR) is an all-encompassing cybersecurity service that detects and responds to cyberattacks. ISTR Volume 24 is here, providing insights into global threat activity, cyber criminal trends, and other happenings in the threat landscape in 2018.